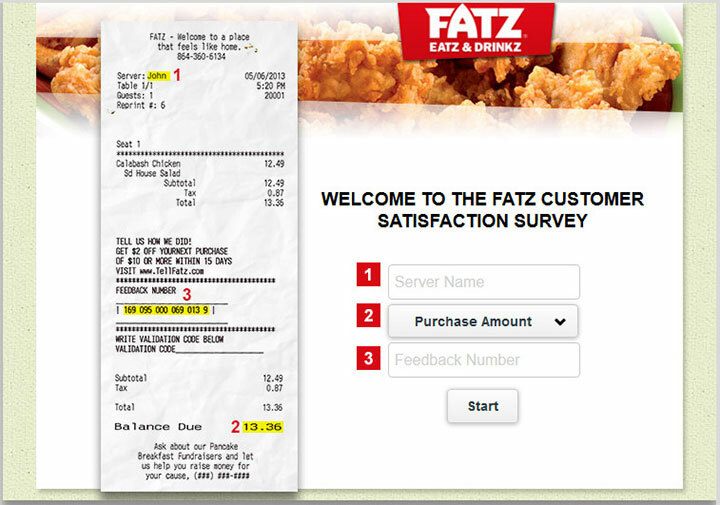 The Fatz Customer Satisfaction Survey, found at fatzcafe.survey.marketforce.com, is an online questionnaire designed by Fatz that measures customer happiness in regards to merchandise and customer service. Companies use the information from these surveys to make updates in their stores, including merchandise or other items. This survey is done online for your convenience. Taking this survey will give you an opportunity to tell Fatz how you feel. They want this information more than you know because they need to know what works. That stuff they don’t need to focus on, as it is already tip top. However, the bad feedback needs to be noted and improvements need to be made. They can’t be made if they don’t know what happened, so the use of surveys comes about. You will also receive $2 off your next purchase of $10 or more as a thank you. Fatz Café is a casual dining restaurant chain that was founded in 1988. The company holds a headquarters in Taylors, South Carolina and currently boasts of 48 locations across South Carolina, North Carolina, Tennessee, Virginia and Georgia. In 2004, the company was named as #316 on Restaurants and Institutions magazine’s “Top 400” list of chain restaurants existing in the United States. Aside from its famous slice of Americana food, the company is proud to participate in local causes that further the development and well-being of the locations that they serve. They are also a long-time sponsor of the Georgia Bulldogs, Clemson Tigers and South Carolina Gamecocks. Have a recent Fatz receipt from a participating store. Type in the server’s name, select the purchase amount from the drop down list, and enter the feedback number. These are all found on your receipt. Click start when ready. Answer questions pertaining to your recent visit. Honesty should be used throughout the survey; it is important that the company receive valid feedback. These questions will allow you to rate your experience with the staff, the food, the ambiance of the store, and the cleanliness of the restrooms and restaurant. Use text boxes when appropriate. There is a space on your receipt that says validation code. When the survey is complete, you write the code you receive on that line.